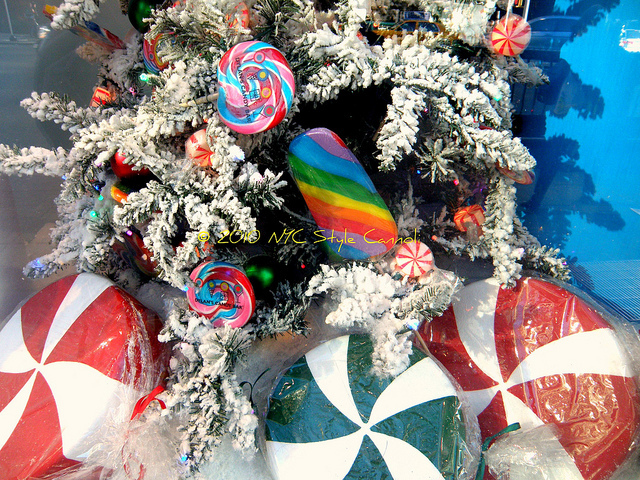 Dylan's Candy Bar New Year's Eve Giveaway!! I am very pleased to be bringing you this wonderful giveaway with Dylan’s Candy Bar! Dylan’s is always a favorite stop of mine when shopping at Bloomingdales as is right around the corner. It is a candy wonderland for those old and young. You can find a mix of the old vintage candy, as well as more modern, up to date, flavors in this New York City candyland. When you enter this wonderful candy shop, you cannot help but smile!! 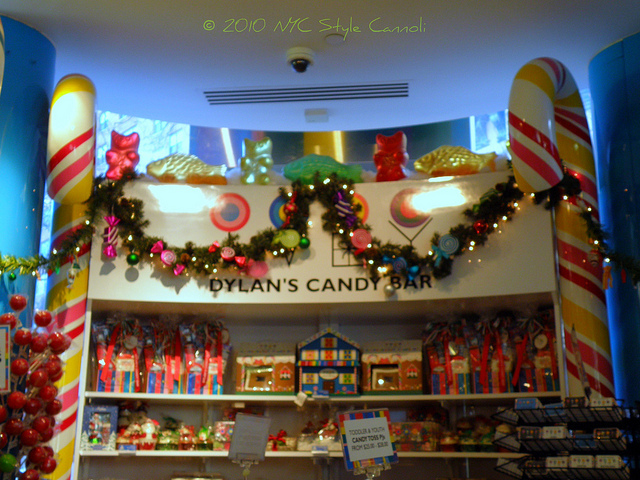 Dylan’s Candy Bar is owned by Dylan Lauren, daughter of Ralph and Ricky Lauren, and author of the book “Dylan’s Candy Bar: Unwrap Your Sweet Life”. This dream started with the movie Willy Wonka and the Chocolate Factory….one of my favorite films!! I just received the 40th anniversary edition for Christmas and was so excited! Dylan's wedding even had a candy theme and you can see some wonderful photos HERE. Although the first Dylan’s Candy Bar opened in 2001, the candy emporium began on Dylan Lauren's 5th birthday – with a showing of Willy Wonka & the Chocolate Factory. 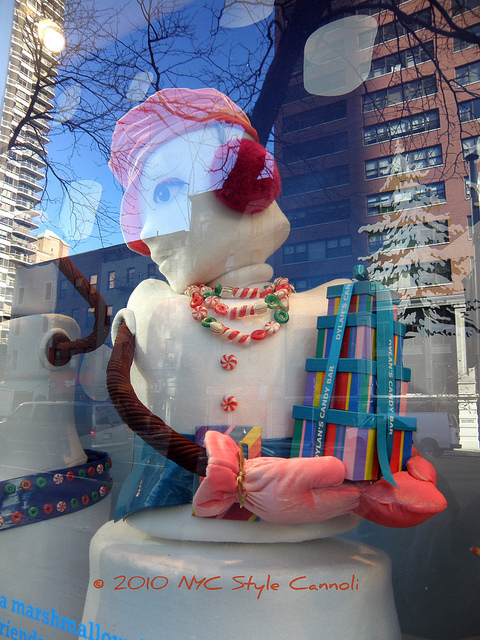 Dylan was so awed by the candy land of Willy Wonka’s factory that it inspired her dream to one day open a candy store. Dylan also has a great passion for art, which she cultivated during her college junior year abroad in London and Rome. Dylan loved the rich art history of the beautiful European capitals, but she also loved discovering and tasting new candies, and admired how artistically they were wrapped. 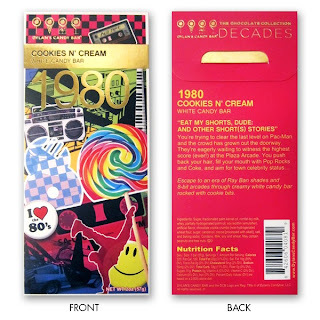 Dylan’s dream of combining a love of candy and a passion for art became a reality in 2001, when the first Dylan's Candy Bar, located in New York City, opened for business. Since then Dylan has expanded her stores to include locations in Orlando, Houston and Roosevelt Field Mall and East Hampton, both in New York state. In 2008 the New York City flagship store was renovated to include a third floor, growing from 10,000 to 15,000 square feet – and making it the world’s largest candy store. The third floor now houses a café, offering classic soda fountain favorites, over 100 ice cream and frozen yogurt flavors, 18 types of Belgian hot chocolate and a bakery full of sweet treats. Parties and events are also held on the third floor – check out our party packages or contact us at 1-866-939-5267 to create a custom-made celebration. Dylan's Candy Bar products are also carried in select Bloomingdales, Saks Fifth Avenue, Neiman Marcus, Nordstrom, Sephora, Urban Outfitters and Juicy Couture stores. 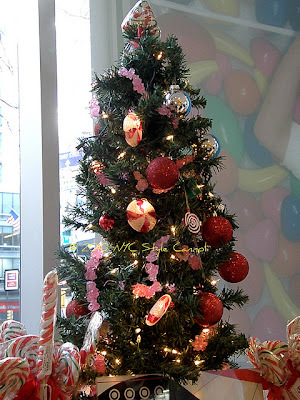 Check out Dylan’s Candy Bar website to see where products are sold closest to you. TO CELEBRATE 10 YEARS IN BUSINESS, THE CHOCOLATE DECADES COLLECTION!!! WONDERFUL HOSTESS GIFT FOR YOUR NEW YEAR'S EVE PARTY. YOU WILL BE VERY POPULAR IF YOU BRING ONE OF THESE TO THE PARTY!! Dylan's Candy Bar Celebrates 10 years with a delectable assortment of chocolate bars. 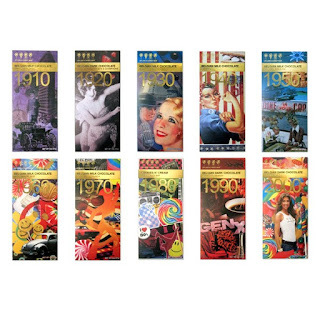 Enjoy a taste of decades past with this complete library of America’s defining eras. Each collectible box tells a story both graphically through evocative designs, and viscerally through carefully selected, iconic flavors. Flavors: (1) Milk Chocolate Cornflake Bar, (1) Dark Chocolate Strawberry Champagne Bar, (1) Milk Chocolate Malt Balls Bar, (1) Smore's (1) Caramel Apple Pie, (1) Orange Zest, (1) Candy Crunch, (1) Cookie n' Cream, (1) Espresso Crunch, (1) Dark Chocolate Sea Salt. Products have been manufactured on shared equipment that processes peanuts, tree nuts, milk & wheat. I would save the wrappers after eating the chocolate and maybe make a collage out of them! 1. Sign up to receive NYC, Style and a little Cannoli daily emails via feedburner at top of blog page. Details: This giveaway is open to US Residents and will remain open until December 31, 2011 at11:59 p.m. EST. Any comments left after this time will not be counted. The winner will be selected randomly and will be notified via email and will have 48 hours to claim their prize. I have not received any compensation for posting this content and I have no material connection to the brands, topics and/or products that are mentioned herein. Dylan's Candy Bar will be providing this giveaway to the winner. My opinions are 100% my own. I followed Dylan's Candy on twitter and signed up to receive NYC, Style and a little Cannoli daily emails. I definitely want to visit Dylan's sometime soon! What a fantastic giveaway that I'd love to win! I just became a GFC follower! I subscribed via feedburner! Yum, chocolate! I follow Dylan's and tweeted! I subscribed via feedburner and followed on Twitter. I will tweet too. I need my chocolate! I also receive your daily emails. I follow Dylan's Candy on Twitter. I follow NYC, Style and a little Cannoli on Twitter. Nice! I follow your blog through Google friend connect. Have a wonderful New Year dear!